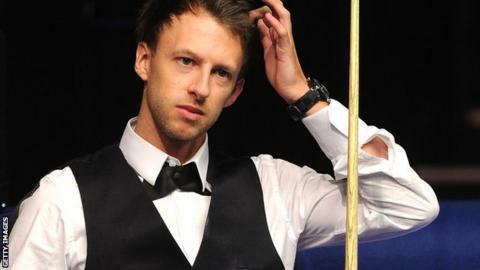 World number two Judd Trump has been knocked out of the German Masters in the last 32 in Berlin. Trump's poor run of form continued as he was beaten 5-4 by Anthony Hamilton, the world number 37. Mark Selby came from 1-0 down to beat Thepchaiya Un-Nooh of Thailand 5-2 with breaks of 68, 123, 104 and 63. On Wednesday, world number three Higgins suffered a shock 5-3 defeat in second round by Yorkshire player Peter Lines. Since winning the International Championship last November, Trump, who was seeded into the second round along with Higgins, has suffered a first-round exit at the UK Championship and a second-round defeat at the Masters. Higgins has had mixed results so far this season, winning the Shanghai Masters in September but losing his second match in both the UK Championship and the Masters. Earlier in the day, another out-of-form player, Mark Williams, was drubbed 5-1 by Shoot-Out semi-finalist Michael Holt, while Mark King beat Stephen Maguire 5-0 in the last 32 - although King was beaten by Matthew Stevens when he returned for his last 16 match later on Thursday. Holt won his last 16 game, while there were also second-round wins for former world champions Graeme Dott and Shaun Murphy. On Wednesday, Neil Robertson saw off Daniel Wells 5-0, Stephen Maguire beat Alan McManus 5-3 and Andrew Higginson knocked out world number 10 Stuart Bingham 5-1.